Canadian author Louise Penny, who'd previously grabbed notice via the CWA Debut Dagger, which recognises outstanding unpublished crime writers, made a real splash in the crime fiction world with her subsequent debut novel, STILL LIFE (St Martins, 2005). That award-hoarding debut (it won Dagger, Arthur Ellis, Barry, Anthony, and Dilys Awards) introduces engaging French-Canadian detective Armand Gamache and his team, and launched a popular series that catapulted Penny into the upper echelons of the genre. I've heard good things about Penny's writing for years, and have several of her Gamache books on my TBR bookcases, but must embarrassingly confess I haven't yet read them. So when I stumbled upon the recent television adaptation of STILL LIFE on British television this week, I was keen to give it a watch. The Canadian production has a very British rather than American feel to it, other than several accents, which seem a strange mix of American rather than French-Canadian, with some British ones thrown in. As an aside, at first I was a little put off by Chief Inspector Armande Gamache speaking with a very posh British accent, which rang false to me (having not read the books), but this is explained well a little later. In a way the television production reminded me a lot of Midsomer Murders in style and cinematography as well as pacing and storytelling. There's a definite 'classic British cosy' vibe, just in a Quebec setting, which I actually really enjoyed. Almost like a modern Murder, She Wrote, but in Canada. There's something comfortingly familiar and enjoyable about that tone and atmosphere; it's certainly a refreshing change from the quick-cutting, glossy, forensic-heavy crime shows that dominate TV channels nowadays. Gamache and his team are called to Three Pines, a quaint rural village near Montreal populated by artistic, outdoorsy and carefree types who live a different kind of life to the big city. When the body of a beloved villager is found shot dead in the woods, no one wants to believe it's anything other than a tragic accident. But there are plenty of puzzling aspects, and the reactions of some in the victim's circle are suspicious. 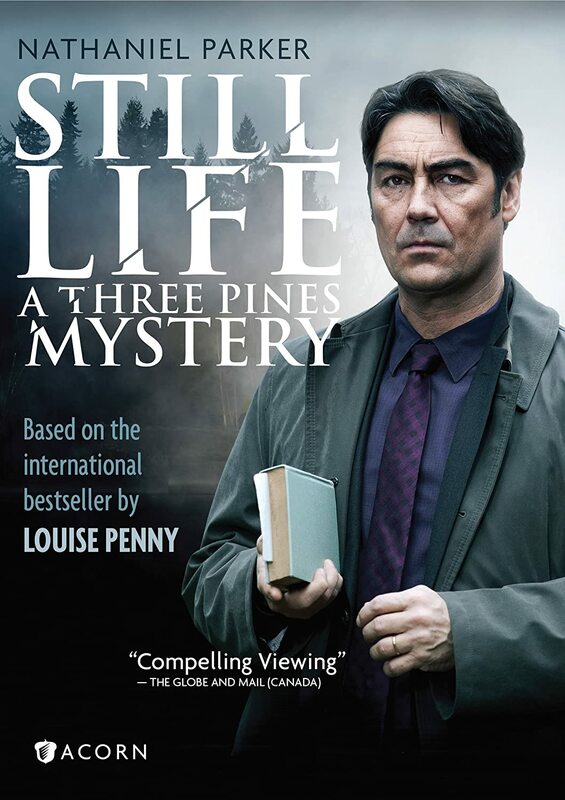 Once I got past the accent, I really enjoyed British actor Nathaniel Parker's performance as Armand Gamache, as well as the interactions between his team as the stresses of the case unfold. Inspector Jean-Guy Beauvoir (Anthony Lemke) and Inspector Yvette Nichol are both very intriguing foils, particular the latter, with her abrupt manner and inability to see past her own conclusions, which nevertheless can be correct. The mystery itself unfolds largely as any fan of classic cosies would expect - clues point in different directions, there are suspects who seem like the culprit before being discarded, we're left wondering what has really gone on or whether our heroic cops will come to the right conclusions (if we've already got ahead of them in some ways). I liked the incorporation of both artistic and hunting aspects of the rural life into the tale, and felt that the setting and the wider cast of characters were all pretty interesting and nicely evoked. Overall this is a good television film, nicely enjoyable, without being in any way groundbreaking or 'wow'. I would certainly watch more TV adaptations of Penny's novels, and it has underlined for me that I really should read some of her books themselves. In particular, Gamache and his team offer a lot of intriguing possibilities, in terms of character development along the course of a series. I liked the languid pace, the way things unfolded, rather than being rushed, and particularly the 'old-school' investigation that involved more deductions by the detectives than some modern cop shows that just follow the evidence. If you like modern takes on the classic murder mystery formula, Still Life is a very nice way to spend an hour and a half or so of your time. I have viewed the BBC production and subsequently read the book. I agree: I will look for more films and will also read more in the series. There is a difference, though, between the tone of the film version and the novel's tone. The film version is light, much like _MIdsomer Murders_, as you pointed out. The novel, on the other hand, has a darker tone that either escaped the filmmakers or was deliberately ignored by them.